People with tennis elbow complain of pain that expands from the outer elbow into their forearm and wrist. The pain primarily occurs where the tendons of your forearm attach to the bony areas on the outside elbow. In addition to pain, people with tennis elbow experience weakness that makes it particularly difficult to hold a coffee cup, turn a doorknob, or even shake hands. 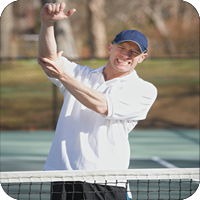 Tennis elbow can cause weakness when twisting or grabbing objects. In many cases, your doctor can diagnosis tennis elbow simply by listening to you describe your symptoms, performing a physical examination, and learning about your lifestyle and activities. However, if your physician suspects other reasons like a pinched nerve, fracture, or arthritis are causing your pain, he may suggest X-rays, Magnetic Resonance Imaging (MRI), or Electromyography (EMG). A chiropractor will be able to determine if a misalignment in your spine, neck, or shoulders may be causing an overcompensation injury. In some cases, a basic chiropractic adjustment may be all your need to stop your symptoms of pain. Your chiropractor will also work with you to determine which activities may have caused your injury and will have you rest your arm while refraining from the trigger activities. Your chiropractor will also likely tell you to apply ice to the outside elbow two or three times a day for two to three weeks. Nonsteroidal anti-inflammatory medications (NSAIDs), such as ibuprofen, naproxen, or aspirin, help reduce pain and inflammation while your elbow is healing. Compression, by using an elastic bandage, is helpful to provide relief and prevent further injury. Lastly, elevating your elbow whenever possible will limit or prevent swelling. If rest and ice do not alleviate your tennis elbow symptoms, then a physical therapy plan is often the recommended next step. You will learn exercises to stretch and strengthen the muscles and tendons in your arm. Your chiropractor or physical therapist will also work with you to develop proper form and technique regarding the activity that was the likely culprit to developing your tennis elbow. Depending on the severity of the injury, your chiropractor or physical therapist may suggest you wear a brace or forearm strap, which will reduce stress on the injured tissue while it heals.